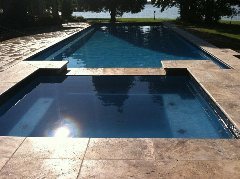 We at Design Pools are proud to help Design the Saltwater pool of your dreams, both residential and commercial. Family owned and family operated. Dive in and play in our fun game pools, lap and diving pools. Exercise pools with swim jets. Plus safe child pool play area's. Where does the pool end? With our Vanishing (Negative) edge designs we can achieve this illusion. 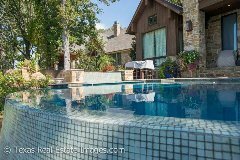 Beach entry pools, Water features, Caves, Grotto's and Waterfalls are just a few of the creations that transforms basic backyard poolscapes into backyard retreats. Using all natural stone. Outdoor kitchens, Cabanas, Pool houses, Outdoor showers, Fire pits and much more. Fiberoptics with IntelliBrite lights the Eco friendly "Greenest" choice in LED lighting. Plus they last 30,000 hours, minimizing replacement cost and disposal. That's why IntelliBrite lights are an Eco Select Choice. Award winning landscaping available. We are up to date with new techniques and products in decorative concrete, stained and stamped, with an eye for detail and talent. BBB has determined that Design Pools of East Texas meets BBB accreditation standards, which include a commitment to make a good faith effort to resolve any consumer complaints. BBB Accredited Businesses pay a fee for accreditation review/monitoring and for support of BBB services to the public.